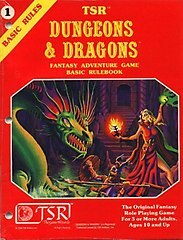 5e D&D pushing sandbox play? I played 5e again last Friday. The players ambushed a couple of Orc couriers carrying a wriggling bundle from their lair to somewhere else in the ravine. Once again the advantage/disadvantage rules shone, as we dealt with long range slinging, a wizard’s familiar hiding in dense undergrowth, and the PCs attacking enemies on higher ground. The halfling rogue started things off by sneaking up the side of the ravine to cut the orcs off, and then smashing the skull of the one carrying the bundle with a lethal sling stone. The rest of the party and their kobold scouts (see last post) burst from cover and laid down missile fire, wounding the remaining orc, who yelled an alarm and ran. Just before he ducked out of sight, the Wizard’s magic missile caught him, and that was all she wrote. The dwarf fighter slit open the bundle to find–not the captive dwarf or halfling she was expecting–but a captive goblin. As orc patrols began coming out to investigate the noise, the party retreated to the kobold cave and conducted a whispered interrogation. It turned out that the captive goblin was the son of the recently killed goblin chieftain, betrayed by his uncle to the orcs. The party agreed to take him back to his home where he claimed to have allies. Fortunately, the guards at the cave entrance were sympathetic, although they were put off by the appearance of an Elf and Dwarf with their would-be chief. Unfortunately, a second goblin patrol aligned with the new chieftain came around a corner and attacked. The party quickly drove them off, although the Wizard had some scary moments when he was hit in rapid succession with two spears. Then the Fighter stepped in and killified the aggressors. The allied goblins, freaked out by the situation, ran one way, while the hostile survivors went in the other direction, shouting for their friends to “bring the Ogre!”. It was a quick session, but Caves of Chaos is still bringing the Old School, and the new rule system is continuing to make me happy as a DM, and my Wizard player even happier. The Fighter and Rogue players seem content with their characters too. It’ll be interesting to see how they fare against the Ogre–or whatever else they decide to do. This playtest is definitely pushing the “sandbox” angle of play. And that brings me to the title of this post. After reading the play test documents, I wasn’t sure whether WotC was giving lip service to sandbox play or if they intended to make it a design priority. Well after reading this article, there’s no doubt in my mind that this edition of the game is intended to support the sandbox. DCs do not scale automatically with level, and instead a DC is left to represent the fixed value of the difficulty of some task, not the difficulty of the task relative to level. Getting better at something means actually getting better at something. Since target numbers (DCs for checks, AC, and so on) and monster accuracy don’t scale with level, gaining a +1 bonus means you are actually 5% better at succeeding at that task, not simply hitting some basic competence level. Nonspecialized characters can more easily participate in many scenes. While it’s true that increases in accuracy are real and tangible, it also means that characters can achieve a basic level of competence just through how players assign their ability bonuses. The DM’s monster roster expands, never contracts. Although low-level characters probably don’t stack up well against higher-level monsters, thanks to the high hit points and high damage numbers of those monsters… the lower-level monsters continue to be useful to the DM, just in greater numbers. Bounded accuracy makes it easier to DM and easier to adjudicate improvised scenes. After a short period of DMing, DMs should gain a clear sense of how to assign DCs to various tasks. It opens up new possibilities of encounter and adventure design. A 1st-level character might not fight the black dragon… But if they rally the town [guard]… and whittle the dragon down with dozens of attacks instead of only four or five, the possibilities grow. It’s good for verisimilitude. The bounded accuracy system lets us perpetually associate difficulty numbers with certain tasks based on what they are in the world, without the need to constantly escalate the story behind those tasks. The items are definitely a nod to complaints that in other editions, nothing really changes, just the DCs get harder for the same activities. I think it’s also great news that even if you’re not super-specialized, you’ll still be able to play a role in the success of your party. One of my favorite things about B/X D&D is how level the playing field is, in terms of talking, improvising solutions, etc. The bit about improvising and adventure design–that’s music to my ears. One of the main joys of running B/X is not having to worry about level appropriate challenges, “precious encounter” design, or other complexity. And the example of the party rallying a bunch of militia to drive off the big monster, that’s right out of the “Combat as War” handbook that’s the default mode of the OSR. And finally, the verisimilitude, which could also be called “consistent reality” and making it easier for players and DMs to judge it, that’s a corner stone of any kind of sandbox. Players need information, so they can make informed choices and maximize their agency. So under the rubric of DCs you are going to ignore that in favour of reading the text as old school? There’s nothing old school or sandboxy about DCs. It still is replacing role-playing with d20s and that’s not cool. I don’t think DCs and sandboxes are in opposition. I think having predictable, non-scaling values for accomplishing tasks is a great way to encourage sandbox play. Look at what Ben Robbins did with his West Marches game–that was 3e D&D, and full of DCs, and it’s routinely held up as the gold standard for sandbox gaming. DCs are a mechanic for resolving things that can’t otherwise be resolved, just like any other. I don’t find the D&D 5e “d20 + stat mod vs DC” to be significantly different from the venerable “roll under your stat” method. Let me throw it back to you: is the venerable NPC reaction roll replacing role-playing with 2d6s? Is the 1 in 6 chance of finding a secret door replacing role-playing? What about Thief skills? Were you playing 3rd level characters? Because the familiar is a 3rd level ability for wizards. Nice catch! The Elf Wizard’s player goofed and didn’t realize that the Familiar ability is 3rd level. Same with the Halfling Rogue’s player–he didn’t realize night vision was a 2nd level ability. Bunch of cheaters. This would be so much better as a computer game.